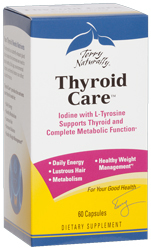 Thyroid Care™ provides iodine in three forms, including potassium iodide, sodium iodide, and molecular iodine for thyroid hormone synthesis, which in turn supports a healthy metabolism. L-Tyrosine, an amino acid required to create the thyroid hormone thyroxine supports mental well-being and daily energy. No: sugar, soy, yeast, wheat, gluten, corn, dairy products, artificial flavoring or artificial preservatives. It contains only natural ingredients. Color variations are normal. Suggested Use: 1–2 capsules daily in the morning on an empty stomach.